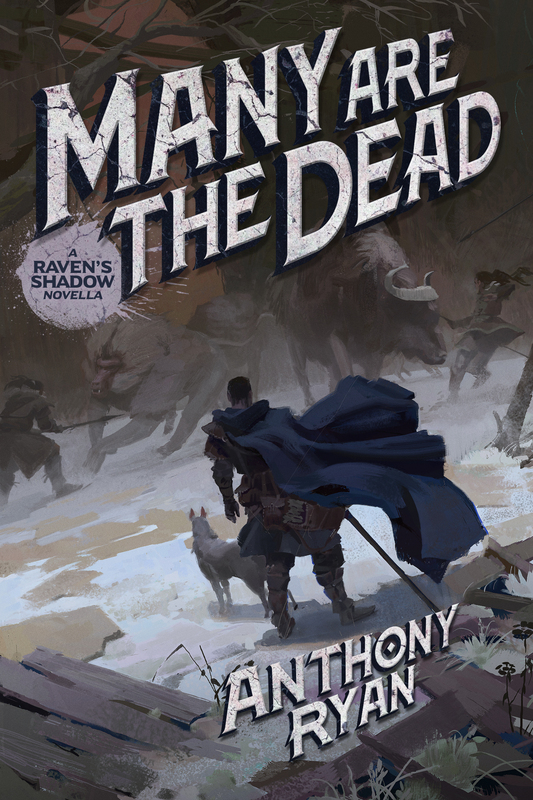 Many Are the Dead – A Raven’s Shadow Novella is now available. ‘Brilliantly written… Anyone who has read Blood Song will adore this.’ – Fantasy Book Review. Congratulations to the ten winners of a signed paperback who have now been notified. Sign up to the Mailing List to make sure you don’t miss a giveaway in future. *(Cover illustration by Kevin Goeke, Design by Shawn King). I’m very pleased at long last to announce the release of Many Are the Dead, an all new never before published Raven’s Shadow novella. Mailing list subscribers will know that I promised this a while ago but for ‘reasons’ had to sit on it until now. The ebook will be released on 2nd November but you can pre-order it now on the Amazon Kindle store: Amazon.com – Amazon.co.uk – and Kobo. Links to ibooks and Nook to follow. Anyone who just can’t wait, or prefers the dead tree option, can order the paperback which is already available: Amazon.com – Amazon.co.uk. To celebrate the release I have ten signed paperbacks to give away to existing mailing list subscribers or anyone who joins the list by the 2nd of November. Winners will be chosen at random and notified on 3rd November. Go here to sign up. Thanks once again to Kevin Goeke (movco-art.com) for the spectacular cover illustration and to Shawn King (stkcreations.com) for the cover and interior book design. Well not quite. Check out this epic music cue inspired by The Raven’s Shadow Trilogy composed by the remarkably talented Will Musser – visit his website for more epic movie and TV soundtracks. I thought I’d share a time-lapse of the line work for my most recently completed map (it’s for a non-Raven’s Shadow/Draconis thing – details to follow soon, I hope). I’ve been trying to develop a more refined, ‘false perspective’ type approach for maps, hopefully, it worked out. This was all done on an iPad Pro using Autodesk Sketchbook for the original drawing and Adobe Draw for the final version. I’m delighted to announce my next novel The Wolf’s Call, the first volume in a two-part series The Raven’s Blade which is a return to the world of Raven’s Shadow and will continue the story of Vaelin Al Sorna. The Wolf’s Call will be published in summer of 2019 by Ace/Roc in the USA and Canada and by Orbit in the UK, Australia, New Zealand and South Africa. No word yet on non-English editions but I’ll keep you all updated whenever I hear anything. This week I carried out a long overdue review of my sales figures and it turns out that, thanks to The Empire of Ashes, I’ve now sold over one million books in English worldwide. It all feels a bit surreal given that it doesn’t seem that long ago when I wrote this post about reaching the what I once thought to be the impossibly out of reach goal of surpassing ten thousand sales, but I guess six years is a long time in publishing. As a thank you to all my readers for making this happen I’m running a mailing list giveaway for a rare signed US first edition hardcover of the book that started it all – Blood Song. The giveaway is open to all existing mailing list subscribers and anyone who joins the list before midnight GMT on July 31st. The winner will be chosen at random and notified on August 1st. The Empire of Ashes – Book Three of The Draconis Memoria – is released today in the UK, Ireland, Australia, New Zealand, and South Africa. Huge thanks to everyone at my publisher Orbit UK for their hard work on this release, especially my editor James Long.